The Arterial Anastomosis around Scapula is principally created between the branches of the first part of the subclavian and the third part of the axillary arteries. The scapular anastomosis happens at 2 sites: around the body of scapula and over the acromion process of the scapula. Deep branch of the transverse cervical artery; a branch of the thyrocervical trunk. 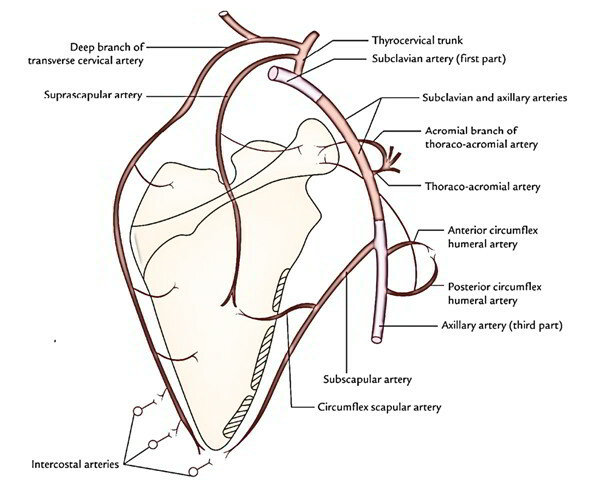 If the subclavian and axillary arteries are blocked anywhere between 1st part of subclavian artery and 3rd part of axillary artery, the scapular anastomosis acts as a potential pathway (collateral circulation) between the first part of the subclavian artery and the third part of the axillary artery, to ensure the adequate circulation to the upper limb.